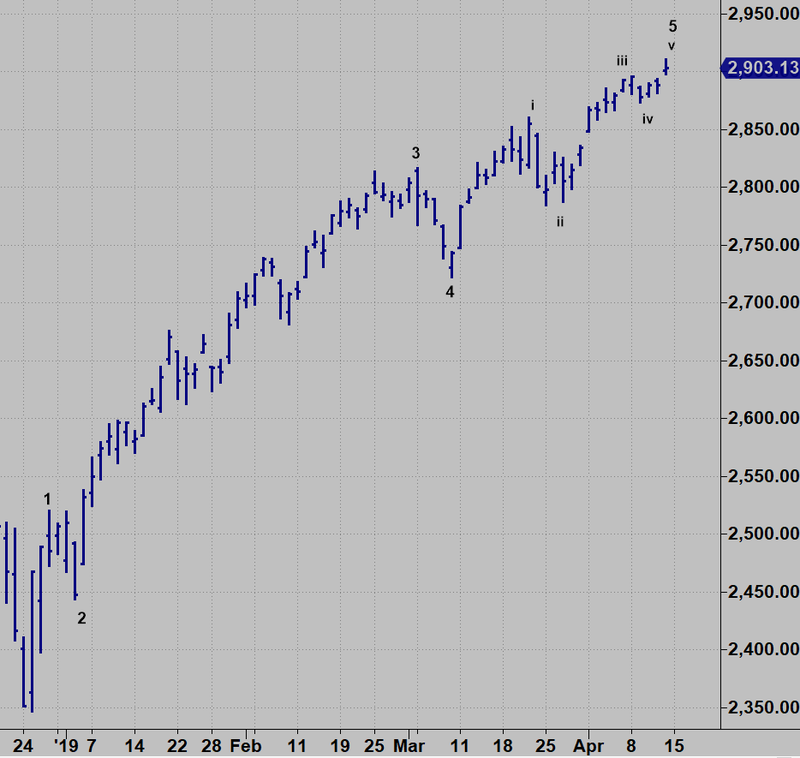 Is the SPX going to new all time highs, right here, right now? As far back as January we wrote about the market’s potential to hit new all-time highs within the context of a bearish structure. With the SPX clearing the 2900 handle and the 2885 region of resistance on the important Friday weekly closing basis as shown in a daily SPX from two weeks ago, the question now is are we going to see all-time new highs directly from here before we see a significant drop. In early April we showed a weekly chart depicting the potential for a Megaphone Top to be satisfied just above 3000. At the same a 3 year Line of Least Resistance from the 2016 lows (green) backtests/ intersects this 3000 region that defines a possible Megaphone or Broadening Top. In other words there is a compelling confluence of resistance on a nominal new high that sees the SPX kiss 3000. While I have believed the SPX would see a new high, the presumption was a strong shakeout, even a decline below the December lows was possible before 3000 would be seen. With last weeks rally over 2885 resistance spelled out in this space many times and a close over 2900 for the first time since early October, 180 degrees ago in time, the market has done exactly what it needed to do to discredit any further bearishness. Mr. Market has taken the rally “high enough” that most operators are certain that the correction is over and that more than just nominal new highs are on the table but that the last two weeks grinding action was a launching pad to 3500 plus. This sentiment is reflected by DSI (Daily Sentiment Index) readings that match the blow-off top in January 2018. “High enough” could easily translate into a tag of the low 3000 region as shown on the weeklies above. But, expectations for volatility have collapsed along with a stunning bubble of complacency. Mr. Market could exploit this complacency at any time. The market is not a fine Swiss watch and now with new highs and 3000 SPX visible in the wake of last weeks action, the market could shakeout first before carving out a Megaphone Top. This would be in keeping with Mr. Market’s inclination for being perverse. Indeed most market participants would be delighted with some pullback greeting it gleefully as a buying opportunity. The notion of a sharp reversal right from here is underpinned by the structure in the daily SPX below that shows a possible 5 wave advance from the December low is complete. The SPX gapped up on Friday and extended potentially completing the pattern from the Christmas low. Closing below Friday’s open gap would go along way to confirming risk is ripe. Given the above pattern, I think the market will probably tell us this week if it still needs to push up toward 3011 or not—directly from here. Conclusion: The confluence of the upper rail on the weekly Megaphone (red) and the Line of Least Resistance (green) intersect over the next week creating a possible timing pivot. So this time frame opposite the October meltdown on the calendar is interesting. If the market turns down this week below 2880, it suggests the 3000 area will probably not be seen until after a sinister setback. Interestingly, a break below the 2880 region started the slide in October 2018. In March NFLX rallied up to a trendline connecting its June all-time high of 423 and its October high and traced out what looks like a mini Head & Shoulders Top in April. On Friday NFLX knifed below its 50 day line leaving multiple sell signals: an Expansion Pivot/ 180 and a Rule of 4 sell signal. The Head & Shoulders projects to the 340 region and the 200 Day Moving Average. A decisive break of 340 leaves it in a vulnerable position for a possible a drop to a 50% retrace of the December/March range (305) with earnings due after Tuesday’s close. Markets tend to play out in three’s. Notice the 3 drives to a low at the December low and the 3 drives to a high at the March high. FTNT is challenging its 94.37 Oct 1 all-time high. Hit & Run members took an audible long in the private Hit & Run Room in FTNT on Wednesday at 89.55 and sold half on Thursday’s opening pike high. However our breakeven stop on the back half got hit on Thursday’s intraday pullback for a scratch. The moral of the story is that once a stock triggers a big league breakout if often warrants adjusting a trailing stop below breakeven after trimming the first half. The tell for FTNT’s runaway continuation move to its all-time high after breaking out last week was offsetting the March Train Tracks top in concert with offsetting the large range distribution day in early April. Despite two large distribution days, FTNT stabilized and turned up. The moral of the story: follow through is key. If they’re not going down on a large range stab lower, they’re probably going up and the stabs lower were Shakeout Bars… a meaningless adverse price move. FREE Hardcover Book: Jeff Cooper's Hit & Run Trading! Don't Pay $50.40 for this book on Amazon. Find out how to get a copy dropped in your mailbox! Yes, I Want This Real Hardcover Book!